Captain Fraser’s Company of British Rangers, or the Company of Select Marksmen was initially raised in the summer of 1776 as a unit dedicated to scouting and ranger operations along the shores of Lake Champlain and throughout much of what is now Adirondack Park in New York. The “selected” or chosen men of six regiments formed the nucleus of a “special operations team” which fought as partisans, alone and in support of Native American warriors, throughout the next two years. 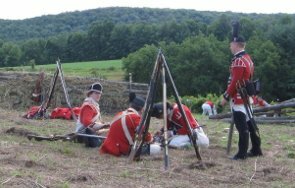 The recreated Company of Select Marksmen was formed in the 1990’s as a means of experimenting with period equipment, camping, scouting, and soldier’s camp and field life. The group participates in a number of events throughout the year, and is continually striving to better their understanding of the time and place. Our specialty is living in the wilderness in 18th century gear—we’ve done it a week or more at a time for over twenty years. This year we will widen our wilderness efforts by becoming stewards of a large tract of the Adirondack Park, where we will maintain trails and provide services to the region and to other park visitors—in kit and with only 18th century tools. In addition, we serve as soldiers at major reenactments—most recently at Fort George, an event we hosted and supported. If you are interested in finding out more about the Company of Select Marksmen, please visit the unit’s website, or join the discussion forum.